The Greek government faces a dire financial situation in the coming weeks, especially as lenders are unlikely to relent on the conditions of last month’s loan extension. In fact, Tsipras’ insistence on of pushing for a “political deal” is going nowhere: German Chancellor Angela Merkel, who he will meet in Berlin next Monday, 23 March, is unlikely to deviate from her preference for technical, rule-based solutions. Therefore, the risk of an internal default due to the inability to pay salaries and pensions is not negligible. Leaving aside the cash crunch challenge, the government’s nationalist strategy is setting the stage for a period of intense turmoil and uncertainty. The 25 January elections were won by a broad nationalist-populist coalition and not by a mere leftist party. While it may have appeared as an odd coupling at first, the coalition deal between SYRIZA and the Independent Greeks is based on at least two commonalities: a narrative of resentment against one enemy (the troika and its domestic servants) and one solution (end of austerity by not recognizing the bailout agreement). As a result, the crisis has been squarely blamed on the bailout agreement and on foreign entities like the troika, who allegedly left Greece’s economy, sovereignty and pride in tatters. The main effect of this narrative of national liberation has been to delegitimise those who argued that austerity and substantial reforms were needed to address the country’s dire economic and financial situations. 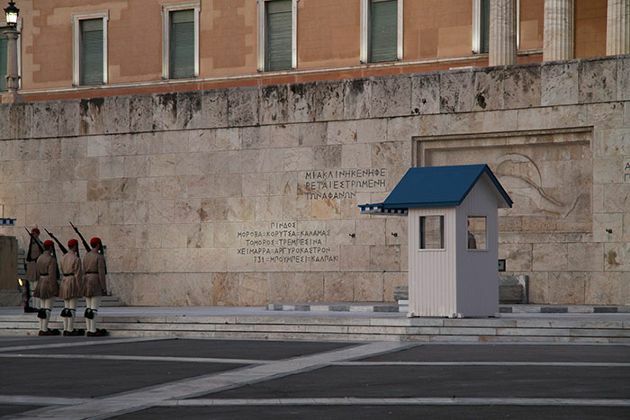 Instead, SYRIZA’s early initiatives all resonate with the country’s traditional clientelistic approach to policy-making, including the rehiring of cleaners at the finance ministry, salary increases for workers at the public power corporation and the pledge to reopen the public TV station (ERT). Tsipras has not hesitated to take a bold stance vis-à-vis Greece’s creditors, most notably by reviving the issue of war reparations from Germany and by attacking Spain for its alleged anti-SYRIZA attitude. In contrast, he has been treading lightly with factions within his party, which have been undermining the already tough negotiations with the creditors. The 11-hour long party meeting in the aftermath of the loan extension is not just a reflection of Tsipras lacking a dominant position within SYRIZA but also of his unwillingness to confront the party’s more leftist factions. Similarly, a light touch has characterised the PM’s handling of his cabinet, despite repeated contradictory and provocative statements by various ministers. SYRIZA is also paying the price for its lack of experience and its limited exposure to the outside world before winning the elections. The comments made by its leaders still largely reflect the modus operandi of a party unable to rise above its past experience in opposition and to adjust to the fact that both domestic and foreign policy require a more nuanced and sophisticated approach. The net result is that Greece has never been so alone during the eurozone crisis. It is difficult to see how the situation could improve in the crucial weeks ahead as Athens and its European partners embark on the fraught discussions over a new package/program that needs to be agreed before the end of June. Even if Greece overcomes its short-term financing challenges, June will be the crucial flashpoint. The government will only implement the less contentious reforms in the weeks ahead in the best-case scenario, sidelining controversial matters like the growing fiscal gap or pension reform, which will need to be addressed when a new package is discussed. Creditors are likely to press for bolder reforms and measures, which in turn could spark frictions within SYRIZA and make it much harder for the PM to keep the party in line. c) it would have to be organized before the payment is due for the first of the two bonds held by the European Central Bank and eurozone national central banks (20 July). A less likely option is calling new elections. This would entail significant risks for SYRIZA as the gravity of the situation may boost New Democracy (as it did in the second elections in 2012). Alternatively, dissidents from SYRIZA’s left platform may pull out of the government and potentially the party, paving the way for a possible reconfiguration of the government. However, this would produce another unwieldy coalition that is unlikely to yield much apart from buying Greece some time. Despite this difficult outlook, a euro exit is still unlikely (20 percent probability). SYRIZA has no mandate to take the country out of the eurozone (the Greek public is still largely pro-euro), and the government would implode well before any meaningful discussions on the matter. Furthermore, any decision on such an issue will crucially depend on the opinion of Brussels, Frankfurt and Berlin, not Greece alone. Despite the recently toughening rhetoric on all sides, these players remain committed to keeping Greece onboard. Still, Eurozone partners and especially Germany will continue to push for technical solutions rather than the “political deal” sought by Tsipras. *Wolfango Piccoli is a managing director at Teneo Intelligence. He serves as director of research and also covers political risk in Europe, with a special focus on Italy, Greece and Turkey. An interesting article. I put the probability of Greek exit at 65%, up from 60% a week ago. The Eurozone will not have to ask Greece to leave - Greece will fall out when it runs out of cash. When that happens, the Greek government will either have to stop paying its bills, including some salaries and pensions perhaps, or else issue some kind of IOU or separate currency. At that point they will effectively have left the euro. No there isn't. Money is dynamic, not static. While it might seem that there is enough money to pay salaries and pensions now, there won't be if Greece reneges on it's external debt. Why? Cause there will be an embargo on Greece, and it's economy will collapse. There is plenty of money to pay salaries and pensions. European loans will go unpaid though and that's a promise. No doubt Mr. Piccolo's colleagues have been part of the advisory group similarly extolling the advantages - nay, inescapability - of austerity, 'reforms', privatization and disintegration of democracy and sovereignty to the Ukrainian government since the February 2014 coup. As ever, capitulation to externally engineered forces is the only way forward. This essay is a far more extreme statement than the commentators polled by Judy Dempsey at Carnegie Europe. It is also full of inaccuracies, elisions and false claims. It ignores the (1) gathering political storm across Europe, and (2) the economists' and market analysts' condemnation of austerity. Nobody except you will care whether Grexit is foreseen in the contracts. When Greece soon goes bankrupt, the Eurogroup will tell Tsipras that they prefer him to leave Euro or they will deny further membership. Ever heard that managers in most cases suggest non performing employees to resign because otherwise their working contract would be terminated?? Since your grace is a Swiss citizen, would you kindly accept the position of Minister of Finance in my new government? All we ask is that you sign a disclosure saying that you never liked Merkel or have anything to do with Berlin or some Austrian citizens defaming Greece on a daily basis while claiming to observe it. Will you eminence? We are desperate for some Swiss clock precision in our daily affairs. I do not contest your so called truth up to "There will be a gigantic default on the pseudo-loans and you know it". Regarding "Incompetent Merkel": That devaluation is the result of Mario's actions happening _against_ the intentions of Germany. And please do not always forget that I am Swiss, so I happily will not participate in those forthcoming payments. These are precisely the lies that this present government will put an end to. Here is the truth: Greece has enough to pay pensions and salaries and nothing (zero money) to rollover the dirty European loans. We will then default on the stinking loans and make you have to pay them directly instead of the bad theater of sending money to Athens so that the next day the same money goes back to Brussels, Frankfurt and Berlin. This theater is over. There will be a gigantic default on the pseudo-loans and you know it. Incompetent Merkel has caused the euro to lose 30% of its value in 6 months. Another 30% loss and your German savings would be worthless. At that point we would be even. A cogent and concise analysis. Thank you! The appalling predicament is revealed by the words "SYRIZA has no mandate to take the country out of the eurozone (the Greek public is still largely pro-euro". So the Greek public, used to as you say a "traditional clientelistic approach to policy-making", insist on staying members of the club but cannot obey and so demand changes to the rules and moreover wish their subscription to be paid at least for now by other members, some of whom are poorer by far than Greece. Add the unwillingness of various EZ governments to give any encouragement to Syriza-like parties in their own countries by concessions to Greece and it is easy to conclude that even more difficult times than those experienced in the recent past now lie ahead. Who says that a default within the Eurozone means Grexit? The faulty architecture of the euro and the Eurozone treaties don't allow such. A default within the Eurozone is precisely what it means: a default whose consequences are felt within the Eurozone and it's up to the Eurozone to clean up the ensuing mess. The moment of truth is fast approaching but it will not be a moment of truth for Greece. Greece has zero to give at this point and many benefits to expect by an engineered default within the Eurozone. This false belief that 80% of Greeks support the euro was the whole basis of German terror and for this simple reason Greece will not allow this lie to persist. Greek default means Berlin pay the bill and so it will.